Mmm… Molasses. This pie didn’t last long enough to get the typical shots. First it was a single slice, then a second because it’s damn good, then my partner got home and had two slices. 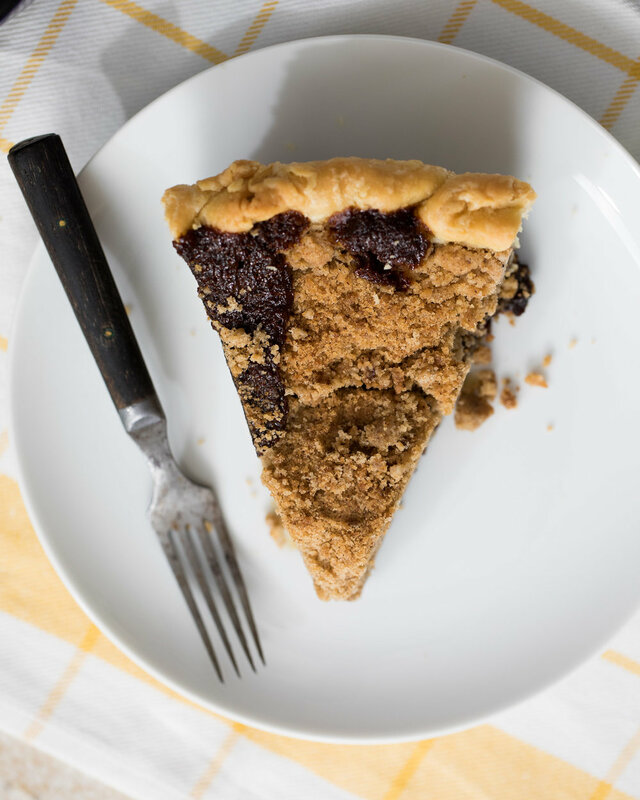 The pie is from the Pennsylvania Dutch and is a molasses filling topped with a streusel. The two components merge to form a caky filling, like a cross between coffee cake and traditional gingerbread. It’s traditionally served at breakfast with a cup of hot strong coffee. Nothing wrong with pie for breakfast, btw. 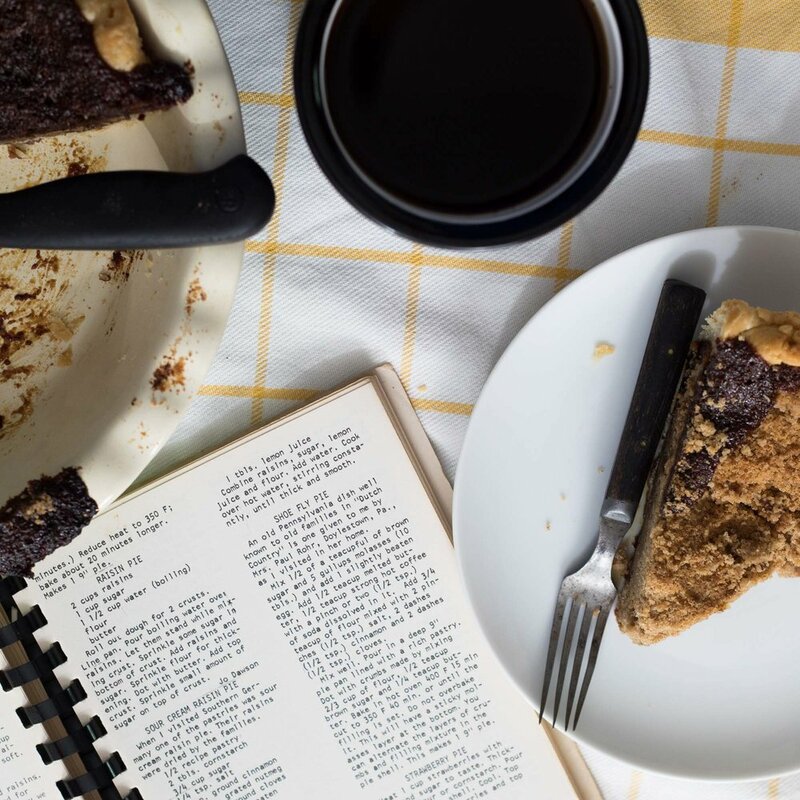 The few recipes I looked at online seemed to be a basic variation of molasses with hot water and baking soda, beat with an egg, then topped by a crumb topping. Very straightforward but also very plain. The recipe I went with isn’t the typical shoofly pie found online. It’s adapted from Mrs. Paul Rohr of Doylestown, Pennsylvania. (Perhaps she's Elsie Rohr, born in Nebraska in 1894, and married to a Paul Rohr, a German.) 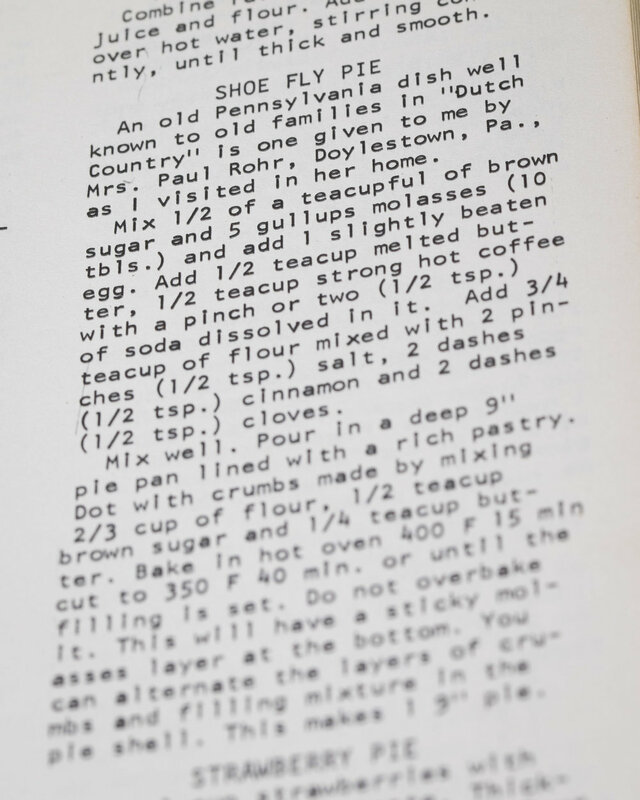 I found it in Seems Like I Done It This Way, a cookbook of collected recipes from Cleo Stiles Bryan, a retired Oklahoma extension home economist. The hot, black coffee pushed me to adapting the recipe. Instead of boiling water, strong coffee and melted butter are mixed into the molasses. It also has some flour as a thickener, along with an egg. Why go with coffee? First, a hot liquid more easily mixes into molasses. Second, coffee and molasses share bitter flavorings that us humans enjoy. Third, it’s an easy substitution that any farm would have on hand that adds flavor and complexity. The crumb topping is straight from the New York Time’s recipe for Shoo Fly. If you’re going for molasses, why not use a crumb topping with dark brown sugar? I’ve cut the recipe by one third to prevent future blowouts. The pie crust is also a bit of an experiment. The other weekend at the farmer’s market, we were chatting with some local beef ranchers with some rendered tallow for sale ($2/lb). The wife said she uses it for baking instead of lard, so I decided to pick some up. The husband heard me say “pie” and he took the 4oz Ball jar from my hand and swapped it for an 8oz’er. So, this week’s crust is tallow and butter. The tallow had much less flexibility than lard. At fridge temps, it shattered into small pieces. There’s definitely a scent of animal to it, too. It isn’t offensive or off, but probably best reserved for pies with strong flavors like shoofly or savory pies. Included in the gallery of shots is the original recipe I used. It’s in gallups, dashes, and teacups. I did my best to adapt it to cups. Prepare the crumb topping by mixing all the dry ingredients, then cutting in butter till it’s the texture of cornmeal. For the filling, mix molasses and brown sugar together, then the slightly beaten egg. Dissolve the baking soda to the hot coffee, then stir into the molasses. Next add in the melted butter. Finally stir in the flour, salt, and spices. For a “wet” bottom, pour the molasses into the unbaked shell and top with crumb. For a “dry” bottom, layer molasses and crumb in the unbaked shell, finishing with a crumb layer. Bake for 15 minutes at 450˚, then reduce to 350˚ for 20 minutes.